Energy systems are under intense pressure to change. Society wants major reductions in greenhouse gas (GHG) emissions, while retaining the benefits that energy systems provide to our quality of life. Understanding the technologies and policies needed to achieve these objectives can benefit from technology-rich, scenario modelling of energy futures. CESAR has been developing and using the database resources, modelling approaches and visualization tools to explore various energy futures. We are excited about the value of this work to policy and investment decision making. University of Calgary students are winning praise and admiration from the energy-environment community for their research on energy systems change and ways to significantly reduce Alberta’s greenhouse gas emissions. Fifty students showcased their research projects at a special event held at the university’s Downtown Campus in December, 2016. Organized by Canadian Energy Systems Analysis Research (CESAR) Initiative, the third annual “Scenarios for Alberta’s Energy Future” event attracted more than 120 people. It was jointly sponsored by the University of Calgary, CESAR and the Energy Futures Lab, an Alberta-based, multi-interest collaboration designed to accelerate the development of “fit for the future” energy systems. Data resources for the student projects were contributed by CESAR using, in many cases, data extracted from CanESS (Canadian Energy Systems Simulator), a technology-rich, economy-wide energy systems model developed by whatIf? Technologies Inc., Ottawa, ON. The natural science and engineering students, in their final year of undergraduate studies, presented research posters under the theme, “Scenarios for Alberta’s Energy Future.” The students are enrolled in the Scie529 capstone project course in sustainable energy, environment and economy – part of the Energy Sciences Concentration in the Natural Sciences Program in the Faculty of Science at the University of Calgary. transforming energy demand through high-density community lifestyles. 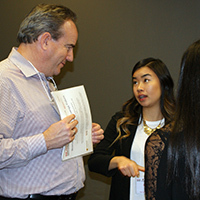 “Despite having only three months to take a project from concept to final report – and considering that most students were also juggling four or five other courses – the teams were able to generate valuable insights regarding possible energy transition pathways in Alberta,” says David Layzell, course instructor and CESAR’s director. “By combining published techno-economic and environment assessments of specific technologies with insights from talented subject matter experts, the scenario modelling approach used by the students provides a powerful tool to generate a window on the costs, benefits and tradeoffs associated with possible energy futures,” he notes. “Decision makers need to make better use of these ‘evidence-based’ tools when setting climate change targets or when developing and implementing policy and investment strategies to meet those targets,” Layzell says. The students’ work got kudos both from University of Calgary attendees as well as those from the external community. “The Faculty of Science values opportunities for multidisciplinary research and high impact learning experiences for or students. As well, we value relevance and excellence,” said Eric Donovan, an associate professor in the Department of Physics and Astronomy and Associate Dean (Research) at the University of Calgary. Erin Romanchuk, an associate at The Natural Step Canada, said the Energy Futures Lab (EFL), which is one of The Natural Step’s five sustainability transition labs, was pleased to support the event. The EFL is exploring what the transition to a more future-fit energy system for Alberta looks like, so the students’ research is a good resource for the EFL’s work, she said. “It helps to engage in conversation on possibilities for the future, and offers the opportunity to see innovative ideas presented in a comprehensive manner,” Romanchuk added. Song Sit, principal at GHG Reduction Consultancy in Calgary and a senior associate at CESAR, co-instructed the Scie529 capstone course, along with David Layzell, CESAR’s director, and Bastiaan Straatman, energy systems modeler at CESAR. The team’s study found that after six years of a reference-case SAGD operation, about 50 per cent of injected heat is left in the underground reservoir. By injecting water into the heated area, 25 per cent of the injected heat could be recovered via produced hot water, which could be harnessed with the Organic Rankine Cycle (ORG) to produce GHG-free electricity to offset net carbon emissions on Alberta’s electrical grid. The ORG is a thermodynamic process where heat is transferred to a fluid at a constant pressure. The fluid is vaporized and then expanded in a vapour turbine that drives a generator, producing electricity. The spent vapor is condensed to liquid and recycled back through the cycle. The team concluded that electricity generated from depleted SAGD heat recovery can reduce emissions associated with electricity use in the SAGD sector by up to 28 per cent. “However, the technology will be held back by its high cost of implementation, possibly requiring that a heat recovery plan becomes a requirement for approval for new SAGD operations,” the team said. Anouk Kendall, president of Decentralised Energy Canada (DEC), said the University of Calgary is DEC’s newest member and she wanted to check out the students’ work related directly and indirectly to decentralized energy. “I was impressed with the diversity of the research topics and the quality of industry professionals gathered in the room. The event will have provided students with excellent industry connections as they further develop their career goals. Well done!” Kendall said. “You could tell the students put a lot of work into their posters, and many insights were gained into Alberta's energy system,” Beck said. “I hope the students are now able to take the constructive criticism they have received at the session and use it to inform future work. Regina Krohn, a post-doctoral researcher in the Faculty of Veterinary Medicine’s Department of Ecosystem and Public Health at the University of Calgary, said she enjoyed hearing about ideas to reduce greenhouse gas emissions in Alberta, which she noted is highly dependent on fossil fuels. “It’s interesting and actually very helpful to see the change in the younger generation to take on this challenge. I saw some good proposals,” Krohn said. “You can see the way these students love to talk about their projects. You can see the way it boosts their confidence to see how interested people are. They’re making connections that hopefully will work out for them in the future in terms of finding ways in to the industries that need them,” Torrie said. Joshua Bijak is spokesperson for the student team whose project focused on decarbonizing freight transport by using renewable natural gas – produced by a “fast pyrolysis” method – as compressed natural fuel in trucks to reduce GHG emissions. He said team members learned a lot from the Scie529 course about energy systems modelling and examining energy systems on a large scale. “Our particular project involved deep understanding of the freight trucking industry in Alberta. Given the complexity involved with these models, we feel that we learned a great deal about the intricacies of a giant industry such as freight shipping,” said Bijak, who’s in fourth-year electrical engineering. The team concluded that using renewable natural gas to power compressed natural gas trucks has the potential to reduce GHG emissions by 23.8 and 29.1 million tonnes CO2e by 2080, depending on which process is used to produce renewable natural gas. As for the poster event, “the wealth of expertise that came to see our undergraduate research was both impressive and at times overwhelming. It provided a lot of validation to many of the assumptions we made for our study and in some cases showed that our model was, in fact, within the realm of possibility,” Bijak said. The team’s project evaluated the possible effects that fully autonomous vehicles, requiring only destination input, would have on the 8.11 million tonnes of CO2e emissions per year from personal vehicles. The students found that under a “consumer-driven” scenario that focuses on convenience for consumers and personal ownership, the use of autonomous vehicles could result in an increase of up to 5.8 Mt per year CO2e, or a 72.6-per-cent increase, by 2060. However, under an “environmentally driven” scenario that prioritizes in making choices to minimize emissions, there could be a decrease by as much as 6.3 Mt CO2e per year, or 87.1 per cent, by 2060. The team concluded that policies are needed in Alberta to encourage the environmentally driven scenario, including a push for “right-sized” vehicles, discouraging long commutes, and encouraging use of electric vehicles. The team’s project found that in 2016, the Alberta cement industry produced approximately 1.7 million tonnes of cement, resulting in 1.7 Mt of CO2e emissions. They proposed implementing molten carbonate fuel cells (MCFCs) into cement plants to capture a significant amount of carbon dioxide and also produce electricity. In their project, MCFCs reduced up to 2.43 Mt of CO2e emissions by 2060, while generating enough power to run the plants and export green electricity to the public grid. However, from an economics standpoint, 2020 is too early for MCFCs to be implemented, and after 2036 the technology will likely become “a more feasible carbon capture solution,” especially if encouraged by new policies for the production of low-emission cement. Blake Evans is spokesperson for the student team whose project investigated five ways to reduce home heating emissions by 95 per cent, including: electrification of home heating; building envelop upgrades; electrical grid greening; retrofits; and increased home turnover rate. The Scie529 course “really helped round out [our] interdisciplinary skills, as well as experience long-term projects, which is often hard to do in a regular class,” he said. The team concluded that with current technology, it is possible to achieve a 95-per-cent reduction in GHG emissions from home heating – from 10.9 million tonnes CO2e projected in 2060 to 0.9 Mt CO2e, but only when combining multiple actions from different sectors. The team determined that Alberta homes produced 12.9 million tonnes of CO2e in 2016, “in part due to our inefficient electrical grid.” They found that micro-CHP systems could reduce annual home emissions by 38 per cent in 2016 and by 10 per cent in 2060. However, due to slow implementation, the technology would have a negligible impact on Alberta’s grid for the next 20 years. The high cost of a micro-CHP unit – approximately $5,500 – was a concern. “The poster presentation was a culmination of the whole course, and all of our hard work, and allowed us to show off our project to academic and industry professionals . . . we felt it made the course more involved and meaningful,” says Peterson, who’s in fourth-year civil engineering. Mariam Bello is spokesperson for the team that looked at the impact on greenhouse gas emissions if the millennial generation lived high-density community lifestyles. She says one of the most important things she learned during the Scie529 course is that there is no “magic bullet solution to the complex problem of climate change,” and a combination of green technologies, processes and initiatives will be required. The course gave the team with various academic backgrounds experience with modelling processes, and “taught us how to formulate reasonable assumptions and how to work with historical data in order to make realistic possible projections,” she says. The team’s project assessed the impact of a lifestyle within communities that combined high-density, mixed land use with better public transit connectivity. They found that there is a potential total reduction of 8.4 million tonnes of CO2e by 2060 associated with a move toward high-density living. With personal transportation, the most significant effect was from reducing the average trip length. Reducing house size was key in decreasing overall home heating demand and CO2e emissions. To encourage these “positive energy trends,” the team suggested subsidizing high-density living, improving public transit, developing infrastructure for families living in such communities, and communicating this information to millennials. Click here to read a story on the poster event by the Daily Oil Bulletin. CESAR, established in 2013, is an initiative to encourage and communicate research and critical analysis around the transformation of Canada’s energy systems. CESAR’s primary goals are to elevate the conversation across Canada around energy systems choices, and to inform policy and investment decisions on transforming Canada’s energy systems toward sustainability. CESAR builds data resources and visualization tools, analyzes past energy systems and models energy future. The Natural Sciences Program in the University of Calgary’s Faculty of Science is a place for students to discover their interests and develop their talents through critical thinking and effective communications in a multidisciplinary setting.